Keeping the water healthy and balanced is the only way for your aquarium environment to thrive. Although freshwater and saltwater tanks have different components to monitor. It’s important to test the water weekly and whenever something seems off or if you fish start acting oddly. To make sure you’re creating the best environment possible, it’s important to find the best aquarium test kit for your aquarium’s needs. What is the Best Marine Aquarium Test Kit? What is the Best Freshwater Aquarium Test Kit? What is the Best Saltwater Aquarium Test Kit? How to Use an Aquarium Test Kit? You need to make sure you’re using the right kind of kit for the kind of water you’re aquarium has. Saltwater test kits won’t work with freshwater and vice versa. The good aquarium test kits are very the ones that are very accurate. The more exact the components are, the better your aquarium will thrive. In order to monitor the health of your freshwater aquarium, it’s important to remember that a lot of potential problems are invisible. The API Freshwater Master Test Kit should be used once a week and when any problems arise. This freshwater test kit comes with everything you need to test the most important elements to your freshwater aquarium: pH, high range pH, ammonia, nitrite, and nitrate. These things greatly affect the life of your freshwater fish. You get an instruction booklet, seven bottles of testing solution, four test tubes, a test tube rack, holding tray, and color cards that are computer-analyzed for accurate comparison and laminated so they can tolerate getting wet during testing. This kit is a great value because you can perform more than 800 complete tests which means it will last a really long time. This kit is accurate enough to determine basic levels and the general health of your aquarium. It can tell you what things that are present that shouldn’t be and will give you a ballpark measurement. This kit is usually enough to monitor and maintain a simple tank. 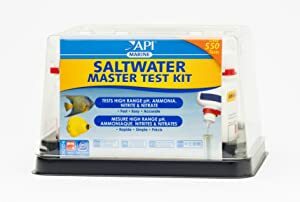 If you have a saltwater aquarium that you need to maintain, check out the API Saltwater Master Test Kit. Using this kit will help you maintain a safe water environment for your saltwater fish and invertebrates. You’ll also be able to use this kit for quite a long time as it includes enough materials to conduct 550 tests. Everything you need to check the most important parameters of a saltwater aquarium: high range pH, ammonia, nitrate, and nitrite. 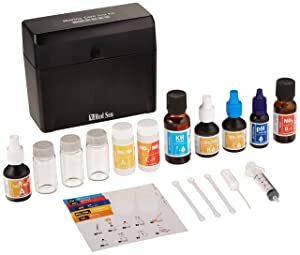 This highly accurate kit includes six bottles of testing reagent, four test tubes, a holding tray, a laminated color card that been computer calibrated for accuracy, and step by step instructions on how to correct anything you discover is unsafe. Use it once a week or whenever you feel there might be something unusual going on in your tank. This kit is a great way to determine general levels and the overall health of your tank. It’ll tell you when things are present that shouldn’t be and can give you a general idea of how much is present. 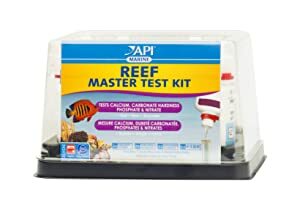 Every kind of aquarium requires different testing and the API Reef Master Test Kit gives you the tools you need to check on the safety of the water for your reef inhabitants. With this kit, you can do upwards of 500 tests. It includes seven bottles of test reagent, four glass test tubes, an instruction booklet and information on how to correct any problems you discover, and two laminated color cards so you can compare your result to the accurate, computer-calibrated measurements. This kit tests for calcium, carbonate hardness (KH), phosphate, and nitrate, all important to the balance of your aquarium reef. Use weekly to uncover any invisible problems your reef dwellers might be facing or when problems pop up. This is a good kit if you’re looking for something for general maintenance and want to keep your water healthy and your plants and animals happy. It will give you a general reading of the levels of various elements in the water but won’t be able to give you a really precise measurement. Another choice if you have a saltwater aquarium is the Red Sea Fish Pharm test kit. It’s easy to use, comes with all the appropriate charts, and tests the essential things that need to be balanced in a saltwater aquarium: nitrate, nitrite, ammonia, and pH/alkalinity levels. One thing that stands out about this kit is how accurate it is: ammonia within a 0.02 ppm, two nitrate tests within 2 ppm a 0.05 ppm, and pH within 0.2 ppm. If you want your saltwater environment to be as accommodating as possible, you need to most accurate results you can get. This kit definitely delivers on that front. You also get simple instructions to not only perform the tests to keep the water stable during the growth and maturation of your plant and animal life but also to perform ongoing maintenance as your environment flourishes. Red Sea offers a lot of research and support online if you need it, which is really nice if you need to make adjustments but aren’t sure what to do. Something to be aware of is that the tests take awhile to develop, but that’s cause this kit gives you a much more precise measurement. 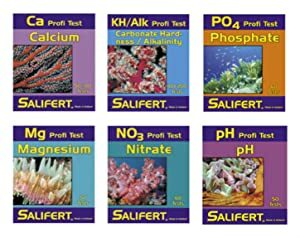 This combo includes six of Salifert’s Master Reef Testing kits for saltwater or marine reef tanks. Together, this set will check everything you need to make sure your saltwater habitat is balanced and healthy. You’ll get tests for nitrate, calcium, phosphate, pH, magnesium, and alkalinity. These are fast to develop and pretty accurate. This is a great starter kit because you get a range of important tests that you need to keep your saltwater aquarium healthy. Replace them as needed as you go along instead of having to buy a whole new kit. With each kit, you get the corresponding reagent, a syringe or dropper to measure, and a test tube to stir. These tests take a little more time to complete than some of their competitors but they’re extremely accurate. Marine aquarium test kits need to be especially accurate because the coral, plants, and animals in this kind of environment are even more sensitive. The Red Sea Fish Pharm test kit is user-friendly and comes with everything you need to test for nitrate, nitrite, ammonia, pH, and alkalinity. This test is really accurate. It measures ammonia within a 0.02 ppm, two different nitrate levels within 2 ppm a 0.05 ppm, and pH within 0.2 ppm. Accuracy is really important for any aquarium but especially when you’re trying to grow coral and other plants. Because this kit is so sensitive, it really allows you to fine tune the aquarium environment. This kit also includes information about how to correct anything that’s not in the proper range so you can perform ongoing maintenance to keep your marine aquarium going strong. 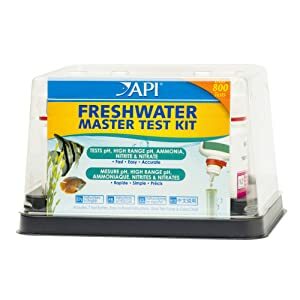 If you’re looking for the best freshwater aquarium test kit, look no further than the API Freshwater Master Test Kit. It comes with everything you need to make sure the pH, high range pH, ammonia, nitrate, and nitrite levels are ideal for your tank to flourish. This kit is an amazing value because it contains enough materials to perform more than 800 complete tests. You get an instruction booklet, all the testing solutions, and supplies you need. Plus, computer-analyzed laminated cards so you can compare your result with an accurate scale to tell you what things are in a safe range and which need corrected. The best test kit of a saltwater aquarium has to be the API Saltwater Master Test Kit. This kit contains everything you need to to keep your saltwater fish and invertebrates happy. This is a highly accurate kit that tests high range pH, ammonia, nitrate, and nitrite – the things that are most important to maintain balance in a saltwater tank. Not only does this kit contain everything you need, it also has enough testing supplies to test 550 times! You won’t need to replenish this kit for a long time because it comes with so many supplies. A good test and a great value – how can you go wrong? While there will be differences from kit to kit and between different brands, all aquarium test kits are used in the same basic way. First, gather your materials: testing solutions, color chart to compare results, test tubes, syringe or other methods of obtaining a water sample from your aquarium. Everything you need will usually be included in the kit. Next, it’s a good idea to label each tube with what is being tested. For example, write “pH” on one tube and “nitrate” on another so you don’t get confused. Repeat for each component and each tube. If you don’t want to write on the tube, label the stand so you know what you’ve put in each tube. This is the only way to ensure that you’ll read the results accurately. Once you have everything labeled, fill each test tube with the amount of water recommended by the instructions for your kit. 5 ml is a common amount but your kit may vary. Add one of the solutions to each test tube. The number of drops will vary, too, so make sure you read the directions specific to your kit. Depending on what you’re testing, drops can range anywhere from three to ten drops. Do one test tube at a time. Put in the right number of drops, put on the lid then shake the tube to mix it up. Then, move onto the next tube, put in the right number of drops, place the lid, and shake. Do this until tube is testing a different component. Each solution will develop and the water will change a different color according to how much of what is being tested for is in the water. Compare the result to the chart included in your kit. If everything is within an acceptable range, you’re good until next week. If something needs to be adjusted, take the appropriate action then retest later in the day. As mentioned, the kit you choose may vary slightly so make sure you read the directions carefully. This is a simple explanation but there are some kits that are a little more complicated that what has been described here. If you’ve spent a lot of time and money building the perfect aquarium, it’s important that you do everything you can to keep it thriving. This includes making sure the water is balanced perfectly so your fish, plants, and other living things all live in harmony and continue to keep your tank beautiful. The only way you can monitor how healthy the water is in your aquarium is to use an aquarium test kit. Remember, saltwater and freshwater aquariums use different testing kits so make sure you’re using the right one. When deciding on which was is best, it only makes sense to use the best water aquarium test kit. This will make sure you get results that are as accurate as possible so you can fine-tune the water so it’s the perfect home for your fish, coral, and plants. I’ve been using API Freshwater master kit for a long time and have always wondered which is best I was going to try another more expensive kit but after reading your eval I’m going to stick with the API master kit , thanks for the info. What items should I buy/have on hand to treat if something tests too high or low? Just trying to avoid another trip to the store. IF you are working with lots of coral, I would get some calcium and magnesium. There are little kits out there that are specific for the coral needs.